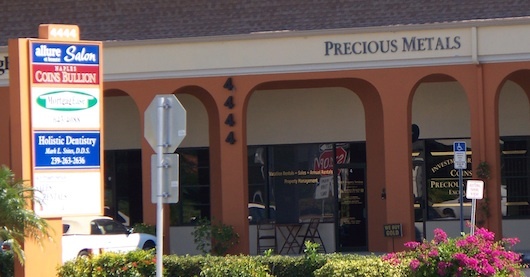 Looking for a Naples Florida coin dealer? Here's where my friends and I have gone. They have a nice selection of bullion precious metals (I've gone in to buy some silver before) and in a variety of selections. They usually have older United States coins plus some newer mint condition stuff too. And they're real nice and helpful. Prices are very fair and they will consider buying your precious metals if that's what you're looking for. You can get silver precious metals for as little as $10 most of the time and it goes up from there into bigger amounts of silver or any gold piece.